I was hoping to be eating nothing but salads and ice cream at this point in the year but seeing as it’s as cold as Autumn, I made a very delicious soup last night which I thought I’d share. 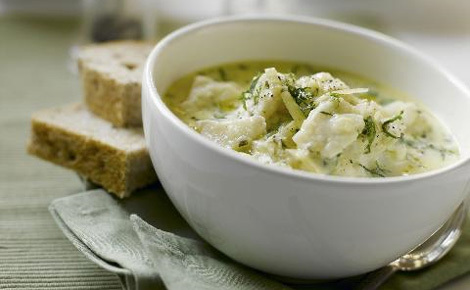 It was a mix between a chowder and Cullen Skink, the lighter version, using cauliflower instead of potato. It was enjoyed curled up in front of the fire. The bonkers British Summer. So, firstly I put a generous splash of oil and a bit of butter in to the pan. Added the garlic and onion and cooked until soft. Then in went the cauliflower and turned around in the onion for 5 minutes or so. I had some chicken stock in the freezer but you can use a cube – I made up about 500ml….just enough to cover the cauliflower and simmer until soft. Near the end I added the sweetcorn, it needs hardly any time at all to cook. Then on to the fish. I halved the fillets and put them in a pan with enough milk to cover, a couple of bayleaves and some pepper. Brought to the boil and then simmered….dont know if that’s the right way to do it but it works for me. While the fish was poaching, I put the soup in to the blender and whizzed it up until really smooth. Now, if I was a proper domestic goddess and wife, I would have put it through a sieve to make it really super smooth – I didn’t. Once the fish was cooked I lifted it out of the milk on to a plate and added the liquid to the soup. Then the fish went in just before we were ready to eat with a good handful of chopped flat leaf parsley and a sprinkle of pepper. It was really good and super quick and very tasty. I don’t have a photograph I’m afraid so here’s a similar soup which I didn’t make.